Astros pitcher Brad Peacock is Thursday's Player of the Day. Peacock struck out nine over seven innings in the 3-2 win over the Athletics. Orioles pitcher Miguel Gonzalez is American League Player of the Day. Gonzalez gave up one run over seven innings and struck out six in the 3-1 win over the White Sox. Todd Frazier of the Reds is National League Batter of the Day. Frazier hit two homers and went 3-for-4 in the 6-2 win over the Cardinals. Billy Butler of the Royals is AL Batter of the Day. Butler went 5-for-5 in the 13-inning, 7-6 win over the Mariners. 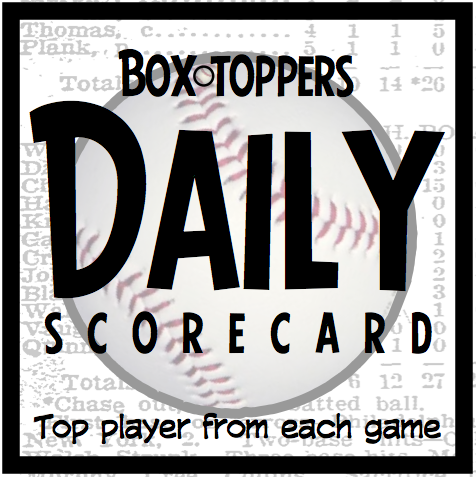 Butler earns 1.5 Box-Toppers points for AL Batter of the Day, giving him 9.0 for the season. He has the most Box-Toppers points for the season among all seven of Thursday's Players of the Game and is in 49th place overall. Peacock receives 2.0 Box-Toppers points for being Player of the Day. Gonzalez receives 1.7 for AL Player of the Day. Frazier and Butler each receive 1.5 for being top Batter of the Day in their league.